I was looking for simple ways to cook salmon with pasta when I came across a recipe for stuffed pasta shells with salmon and ricotta cheese. It looked simple enough. And when I came across some conchiglioni or large pasta shells, I quickly bought a packet. I thought it would be one of the more interesting ways to cook salmon with pasta. Moreover, my earlier experiences preparing recipes with ricotta cheese had been very positive. I found ricotta cheese to be very easy to use - just mix with other pasta ingredients - and I rather liked the mild, yet rich flavour. That was some months ago. The packet of conchiglioni had been sitting in my kitchen while I waited another few weeks to buy my ricotta cheese because only a few supermarkets sell it - and then another couple of months before I bought my salmon fillet, because those at the market didn't look good. Actually, the recipe called for canned salmon. But there are so many simple ways to cook salmon fresh, why settle for canned food? I could steam, grill, bake or pan-fry it. In the end, I just popped it into my toaster oven for about 6 minutes. Drats! The recipe called for whipping cream, which I did not have. I was not in the moods to go all the way to the supermarket just to buy whipping cream. I had to improvise on ways to cook salmon and thought, instead of using cream, I would serve the dish with a creamy, pureed spinach. But... See my notes below about the whipping cream. Cook spinach with water and sea salt, over high heat for three to four minutes. Allow to cool, then puree in a food processor. Before serving, beat two egg yolks into the spinach. Warm gently until the spinach thickens, taking care not to over-cook the eggs until the curdle. Cook salmon - pan fry, grill, steam etc - there are many ways to cook salmon - until they are just about cooked through, but not over-cooked. This takes 5 to 8 minutes, depending on the thickness of the salmon. Remove from heat and break up into flakes. Cook conchiglioni according to packet instructions. While conchiglioni is cooking, mix together the salmon flakes, cheese, herbs, salt and pepper. 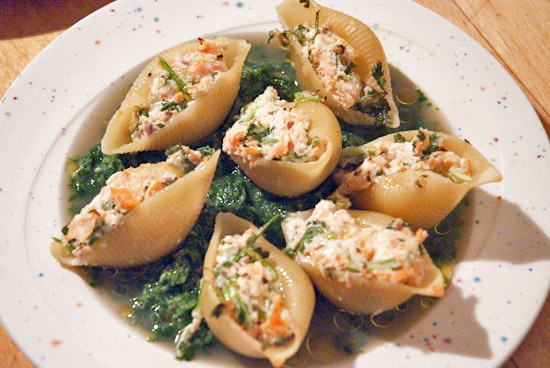 Arrange cooked conchiglioni on a baking try and filled each pasta shell with 2 tsp of the salmon / ricotta cheese mixture. Serve on a bed of pureed spinach and dribble some olive oil over the stuffed pasta shells.